Far from analog, this digital thermostat is one smart machine. In the age of the smartphone, it seems only appropriate that someone -- somewhere -- would come up with a thermostat that goes way beyond programmable. I am talking about a smart thermostat -- specifically, the Nest Learning Thermostat T100577. I hope you have a comfortable read. If you are sitting in an uncomfy home environment as you read this wizzle, perhaps it is time to buy the Nest. They called this thinking thermostat the "Nest". That is neat. Think in terms of your home -- your "nest", as so many people nickname it in conversation. You want a nest that is comfortable -- livable. You don't want a nest that is not economical -- and you might want it to be green(er). That is where the Nest Learning Thermostat is designed to help you. It gives you a "smart house", if you don't already have one -- the Nest is controllable remotely by smartphone and wi-fi. Programmable thermostats have been with us for decades, for sure. 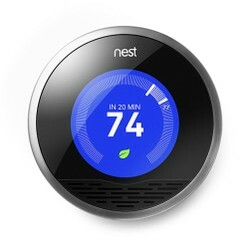 The Nest aims to take the programmable thermostat to the next level. To program the Nest, all you have to do is move its dial whenever you need the air in your home warmer or colder. Over several days, your Nest unit will "learn" your preferences and modify its programming accordingly. Soon, you will not need to touch your Nest on most days -- it will move the temperature in your home up and down for you. Info on how to access Nest Labs' concierge service, for professional installation, in the event you do not want to self-install your Nest unit. At Nest Labs, they say, "The leaf helps you conserve." It refers to the leaf image on the Nest Learning Thermostat's screen. When you see the leaf appear on your Nest's screen, then you know you are using less energy to change your home's temperature. One thing that needs to be made clear about the Nest Learning Thermostat is patience is required. In fact, the product runs on this axiom. It is not as if it is going to learn your preferences on day 1, so be prepared. Soon though, your Nest will be "running itself". Online shoppers mostly love the Nest -- mostly. Two-thirds of the customer reviews on Amazon at this writing (45 out of 68) give the Nest five stars. That is a nice number for any new product. If you want to read the five-star reviews on Amazon, go here. It also bears noting that some Nest customers have expressed dissatisfaction. 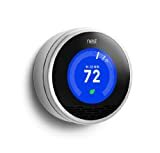 The consensus of the negative comments on Amazon is that this product is only comparable to other programmable thermostats, and that customer service needs improvement. If you decide to buy the Nest Learning Thermostat, please let the world know what you think about it by leaving a comment below.